ProVia is the industry leader in offering a professional-class door for residential applications that provides you with the durability, security, beauty and energy efficiency your family deserves. As a homeowner, you can take pride in having a door that is exceptionally crafted for your home, confident that your home has the most secure residential door within the industry, and pleased with the energy savings you experience every day. ProVia has been a manufacturer of high quality entry and storm doors for over 30 years. Their commitment to building quality doors is evident in the craftsmanship and robust designs that they offer. 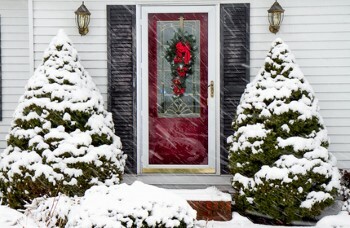 At Windows Plus, we offer you a number of ProVia products including entry doors, storm doors, and hardware.ProVia is committed to making products the professional way: specifically customized for homeowners to the highest standards of durability, security, and energy efficiency in the residential market. ProVia entry doors are available in a wide array of door styles in the ProVia Signet® and Heritage™ fiberglass door collections. This lightweight yet very durable construction comes with a number of inherent advantages. Because of their 10 layer Mylar vapor barrier, they are cooler in the summer and warmer in the winter. They feature enhanced noise reduction, and are also available in a wide range of colors and hand-applied stain finishes with up to a 10-year finish warranty. Dozens of decorative glass choices or internal blinds are enhanced by Provia's ComforTech™ glass system. Our line of ProVia storm doors includes the Spectrum, Decorator, Duraguard, Deluxe, and Superview models. These products are built with durability and long life in mind, and available wide array of colors and features. In addition we also offer a comprehensive line of ProVia hardware with locking systems from manufactures such as Emtek®, Trilennium™ and Schlage®, including Schlage LiNK, a keyless system featuring remote access and monitoring.